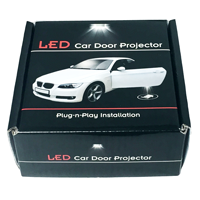 An LED Car Door Projector is the perfect addition to any vehicle. Each LED light projects a full color logo below the car door. Our Lights are specifically designed to be an exact fit for OEM courtesy door lights. No modifications to your car is necessary, easy plug and play installation. With a wide variety of logos available, you will find an option perfect for your vehicle.